Be sure to check out my fall floral hoop wreath here! April showers bring May flowers, or how does the saying go?! All I know is that we have been sopped in with rain for weeks here in Northern California. And it’s not even April! So, even though we desperately need the rain, I am looking for hints of spring! I haven’t updated my porch since my Modern Valentine’s Day porch. 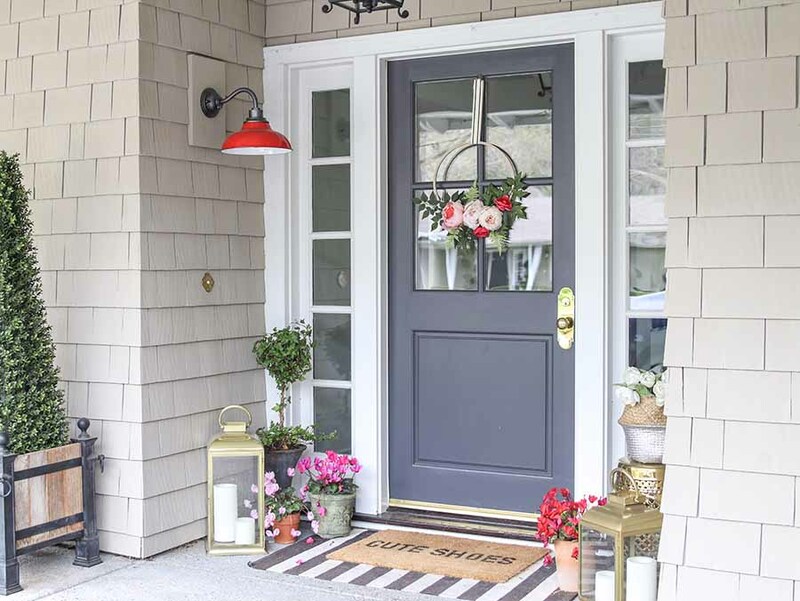 I am still loving the layered doormats and bright pops of color. But I wanted to add a little taste of spring to this scene. 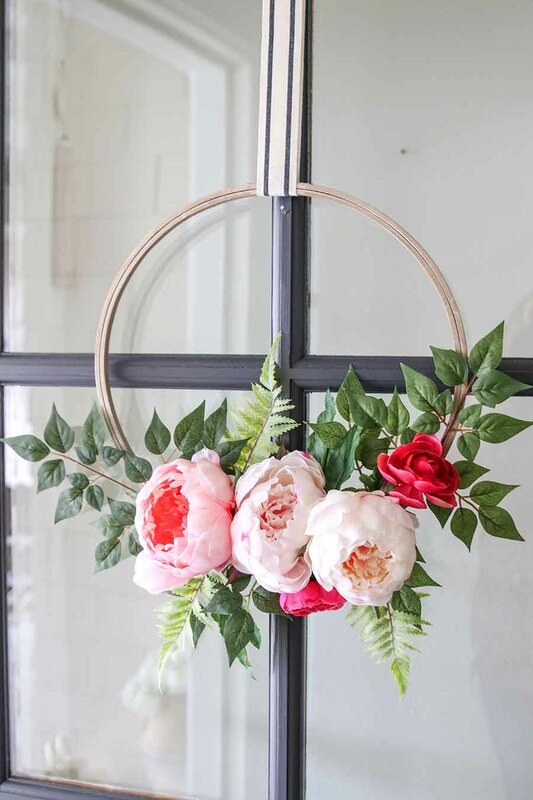 So, I created this DIY: Modern Spring Floral Hoop Wreath. 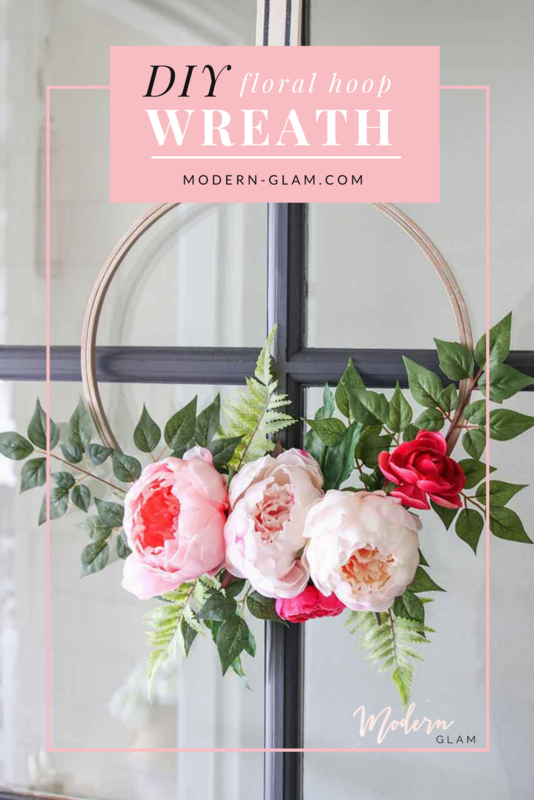 And let me tell you, this was one of the easiest wreaths to make and I just adore it! Let me show you how simple it is. 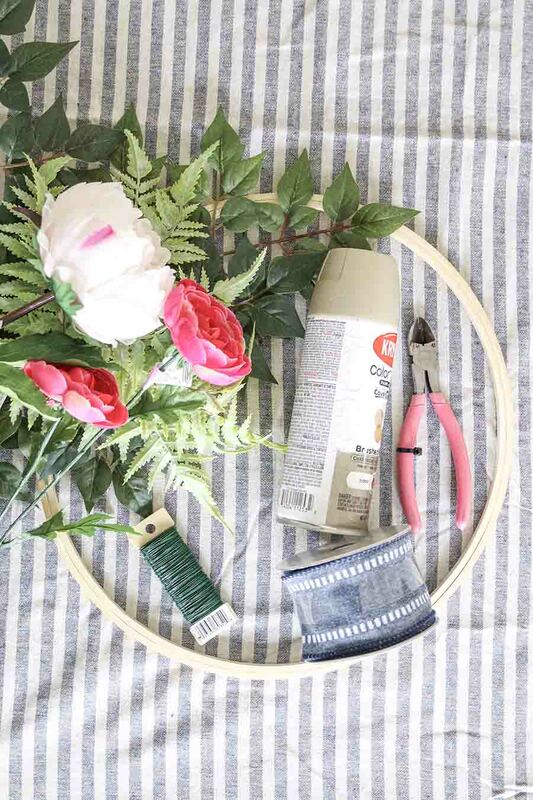 Spray paint your embroidery hoop. I chose this satin gold color. I feel like this adds a more modern touch to the wreath. But feel free to leave yours natural or spray it any color you have on hand! 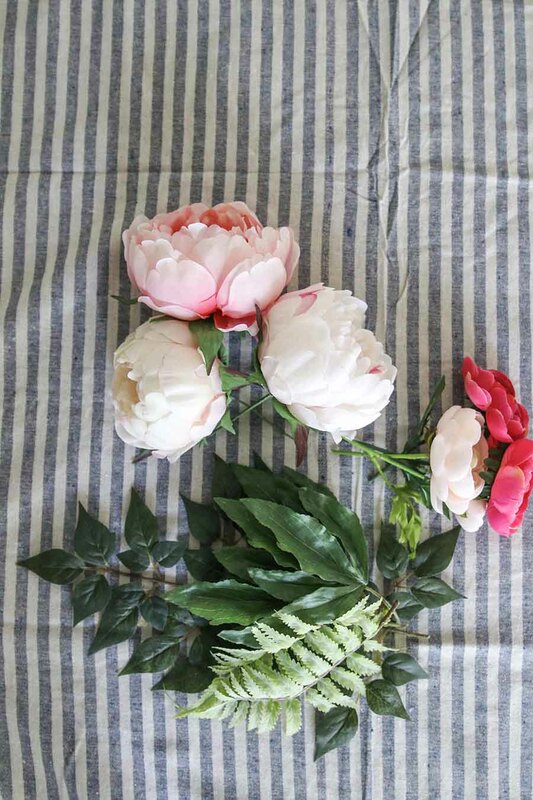 Separate your flowers and leaves from the stems. This allows you to work in smaller sections and get just the right look. Place the leaves down first on the embroidery hoop and then layer the flowers on top. There is no right or wrong way to do this. Play with it until it looks right to you! Secure each section using floral wire. You may need to use some hot glue to prevent the flowers from falling forward or down. I put a little dot of hot glue on the back of each section where the floral wire was secured. And be sure to also check out my fall floral hoop wreath here! This is such a simple and fun project. 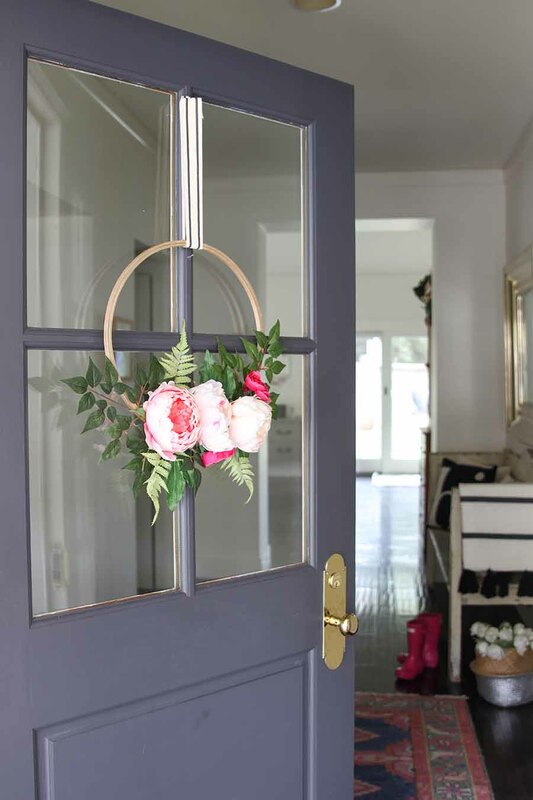 I love how it adds a modern touch of Spring to my entryway! If you want to stay in touch, please sign up to receive my newsletter by clicking HERE! Previous Post: « Friday Friends Parade – Easter Inspiration! your wreath is gorgeous. I love how fresh and crisp it is, so a perfect feminine match to your cute shoes mat. 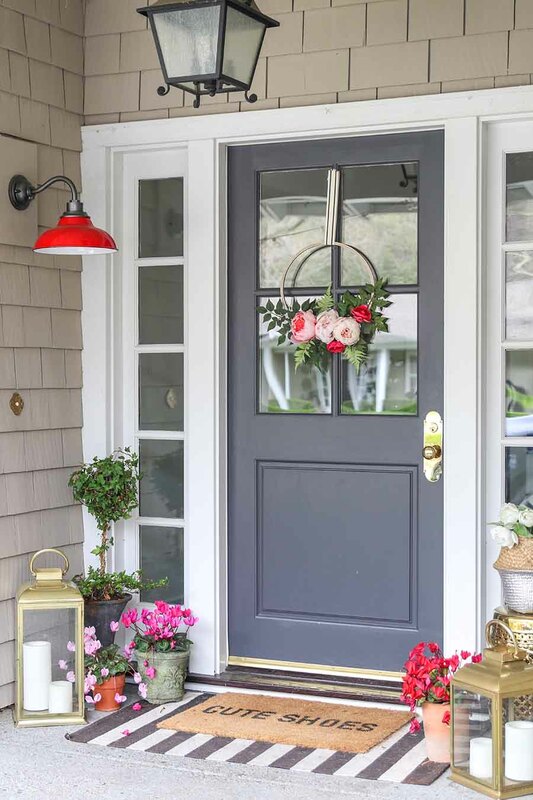 What a beautiful front entrance for Spring. Hi! It is Benjamin Moore’s Wrought Iron. 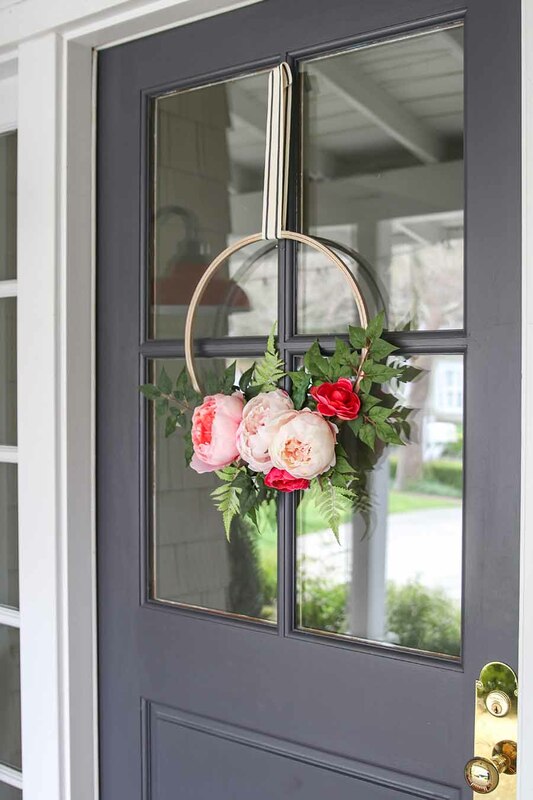 I adore your wreath and your spring front porch. It is so inviting and colorful. 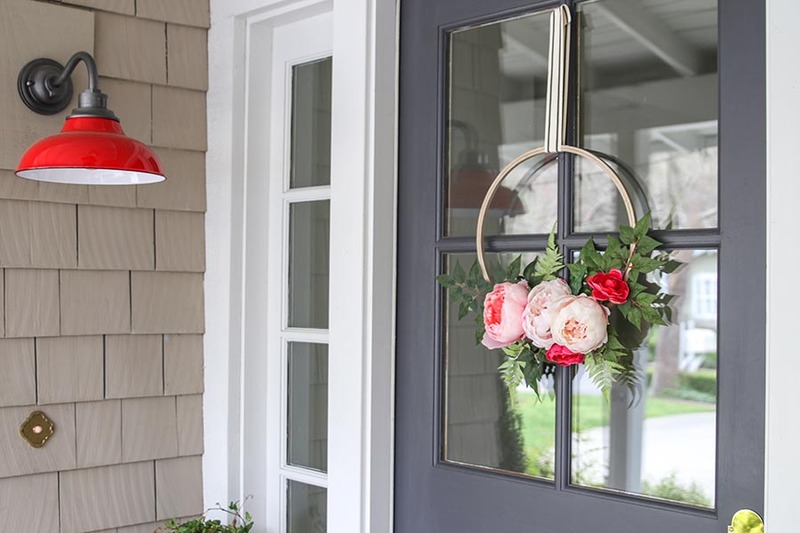 You know I’ve always wanted to create this hoop wreath, and now I think I’ll have to try one for my front door. Thanks so much for joining us on this blog hop!!! 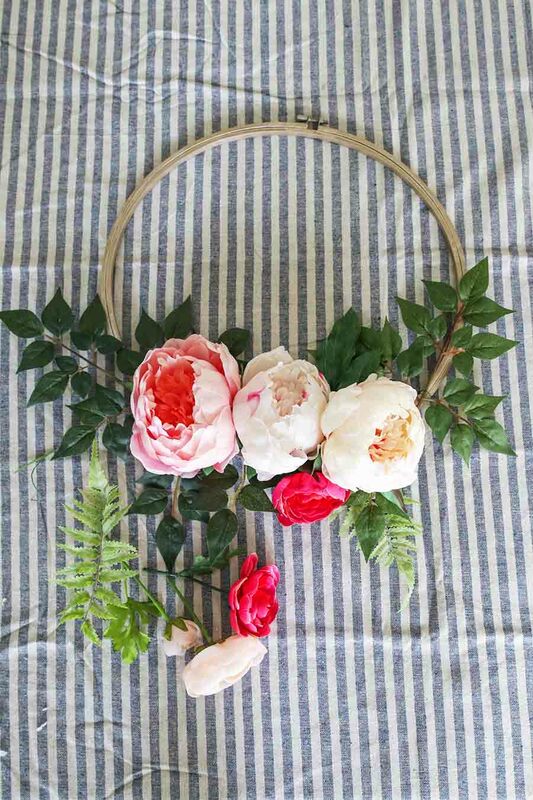 I love hoop wreaths and when they are made with ranunculus and peonies, even better! Your wreath is gorgeous!! This wreath has turned out so gorgeous. it is looking awesome on the front door. Your Spring wreath is so pretty! I love embroidery hoop wreaths and the flowers you chose look great! 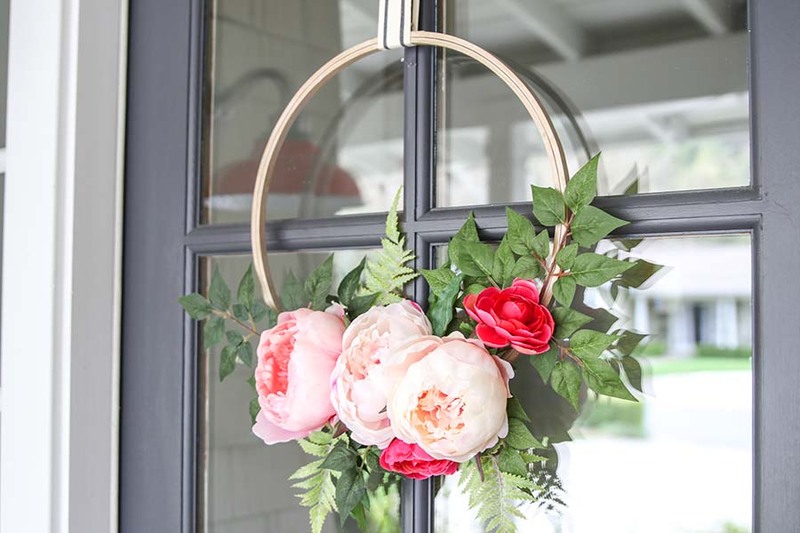 This is such a lovely wreath for Spring and it looks beautiful on your front door. I know how you feel about longing for Spring, hoping we start to see it soon! I LOVE THIS WREATH AND I’M SUPER EXCITED THAT I HAVE SOME OF THESE HOOPS ON HAND THAT I KNEW I’D FIND A USE FOR EVENTUALLY. THANKS fOR SHARING! ALSO, I HAVE TO KNOW, WHAT IS THE COLOR CALLED ON YOUR DOOR? IT’S AMAZING!! Did you pull the flowers off the stems or trim the stem? I am making one and not sure if I pull off the flower from stem and then hot glue to the hoop or leave stem on and use wire to wrap it onto hoop. Thanks!